By Greenito on	 January 20, 2016 Did You Know? It doesn’t seem fair that working out and counting calories goes all for naught when you start pigging out because of the marijuana munchies. 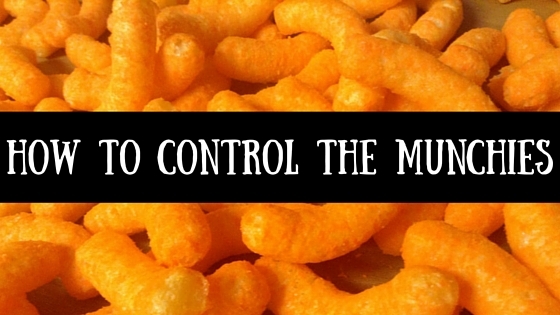 Here are a list of things you can do to curb your munchies before it gets out of hand. 1. Cut up a bowl of fresh fruit to eat and add a heavier component such as granola or low-fat yogurt. Fruit is quite filling due to its water content and adding something extra will help with satiety while still keeping the calorie count modest. 2. Drink plenty of liquids, particularly water or healthy fruit juices. Oftentimes we resort to eating when in fact our body is trying to tell us that it’s thirsty and not hungry. While it probably won’t totally eliminate your hunger, drinking liquids can decrease your appetite and make you feel fuller sooner. If you need something heavier than water or clear fruit juices, try blending some fruits and vegetables in a VitaMix or blender to make a smoothie. 3. Try to smoke in a social setting. Having people to talk to while smoking marijuana is your chance to get lost in conversation that will take your mind off any hunger that might be residual from smoking. If you prefer not to smoke in a social setting, you can still take your mind off your hunger by entertaining yourself – perhaps watching a movie or dancing to music. 4. Have a predetermined set of “marijuana munchies” which you know are low-calorie and healthy. In addition to fruit, rice cakes and un-buttered popcorn are filling low-calorie options. Just make sure to place them in an easy to reach location so you can grab them without even thinking about it. On a related note, try to stock your refrigerator full of wholesome foods and avoid purchasing sugary snacks when you go grocery shopping. 5. Try to come up with a food ritual surrounding your marijuana intake that feels good for you. Many people like to eat something before they smoke which helps keep the munchies away. Part of your ritual might also involve preparing a small snack ahead of time like the bowl of fruit yogurt mentioned earlier to help curb any residual munchies you might have. 6. Brush your teeth before smoking marijuana. The mint flavor of toothpaste strongly clashes with sweet and savory foods, which makes it less likely that you’ll eat them after brushing your teeth. If getting up and brushing your teeth is too much of a hassle, consider chewing on mint bubblegum immediately after smoking. 7. Look at the medical marijuana strains that you’re purchasing from your dispensary. Obviously try to stay away from those strains that are advertised to increase appetite. You also want to take notes on the different strains you smoke to learn how each one affects you differently. 8. And if all else fails, realize that getting a case of the marijuana munchies is actually a great cue for practicing self-control. If you simply ignore the urge to snack it will often go away after about 5 – 10 minutes. You can learn to dialogue with yourself and reassure your body that it doesn’t need to eat: it just wants to partake because food tends to taste really good when you’re high. Find the best deals on marijuana here.